Chinese icebreaker Snow Dragon (Xue Long in Chinese) has escaped from the thick ice floes that trapped the ship after its successful Antarctic rescue mission. According to Xinhua, the ship successfully emerged from the ice at 6:30 pm Beijing time on January 7. Snow Dragon will return to its scheduled activities as part of China’s 30th Antarctic expedition, China Daily reported. Because of the delays involved in rescuing the Russian ship and extricating itself from the ice, it’s unclear whether Snow Dragon will have time to complete the tasks originally set out for it, including scientific research as well as the construction of a new Chinese research base. The Snow Dragon became stuck in ice after conducting a rescue of another stranded ship, the Russian vessel Akademik Shokalskiy. That vessel became trapped in Antarctic ice on December 25. Its passengers remained stranded for over a week until the Snow Dragon arrived on the scene. On January 2, a helicopter from Snow Dragon was able to safely remove all 52 passengers from the Akademic Shokalskiy, and transport them to the Australian ship Aurora Australis. The helicopter rescue was necessary because neither Snow Dragon nor Aurora Australis was able to cut through the thick ice that had trapped the Russian ship. Unfortunately, after completing the rescue, the Snow Dragon found itself surrounded by ice that was reportedly three to four meters thick, beyond Snow Dragon’s capabilities to break. While the Snow Dragon crew waited for weather conditions to change, the Australian Maritime Safety Authority requested that the U.S. Coast Guard send a ship to help break free both Snow Dragon and the still-stranded Akademik Shokalskiy. The U.S. Coast Guard dispatched the Polar Star, which can break ice over six meters thick. Finally, Snow Dragon was able to escape the ice with the help of favorable weather conditions. Qu Tanzhou, director of the Chinese Arctic and Antarctic Administration under the State Oceanic Administration, told China Daily that the “westerly wind” that arose on Tuesday “makes the floes and ice surrounding Xuelong [Snow Dragon] more loose.” Qu’s prediction was correct, as Snow Dragon was able to free itself on Tuesday evening. The Polar Star, which is scheduled to arrive in the area on Sunday, might still be needed to help the stranded Russian vessel. The incident is a positive example of international coordination and cooperation. The Australian Maritime Safety Authority coordinated the initial rescue mission, wherein a Chinese icebreaker (assisted by an Australian ship) aided a stranded Russian vessel. When Snow Dragon itself became stranded, a U.S. ship headed over to offer its assistance. As U.S. Coast Guard Pacific area commander Vice Admiral Paul Zukunft said, “Our highest priority is safety of life at sea.” Clearly, this is a priority for all of the countries that took part in this mission. All ships involved (including Snow Dragon, Aurora Australis, and Polar Star) delayed their original missions to help with rescue efforts. The rescue sage represents a successful example of international communication and cooperation over a humanitarian mission — exactly the sort of interaction that can help foster mutual trust between different nations. Each group of sailors involved — Russian, Chinese, Australian, and American — knows and understands first-hand the extreme hazards of sailing in the Antarctic. The crews involved may come from different nations, but they are all part of the unique and sometimes dangerous club of Antarctic exploration. Accordingly, they must work together to ensure each other’s safety — and if this story tells us anything, it’s that all the crews involved were willing to do just that. 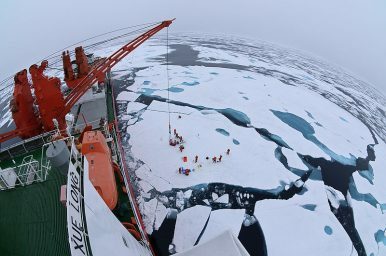 China's lone research icebreaker, the MV Xue Long, may be stuck in thick Antarctic ice after a heroic rescue effort. China’s Planned Nuclear IcebreakerWhat Are China’s Plans for its Airborne Corps?The Doolittle Raiders and Chinese Revisionist HistoryFoxconn CEO Terry Gou Says a Sea Goddess Has Told Him to Run for PresidentWill Xi Jinping Visit North Korea This Year?